Veteran blogger and social media personality MJ Quiambao Reyes lauded the Commission on Audit for ordering at least five (5) PhilHealth Officials to return to the government a total of P20,072,671.09 that they authorized as perks and extra compensation to employees without presidential approval. According to MJ Reyes the decision of COA is indeed commendable because of the facts that there were former officials and directors appointed by different agencies of the government that received the huge amount of salaries and privileges from the government but they kept on barking against the administration of Pres. Rody Duterte. One of the reasons for these former government officials is their personal intentions to work with the government and continue their anomalous transactions and as the recipient of huge perks and salaries in government. The other reasons are to keep their anomalous transactions hidden from inquiries, exposed by COA or cases will be filed against them due to their involvement in receiving huge perks. Good! Let's do the same and ask the other directors & executives of gov't owned & controlled corporations and gov't agencies (past & present) to return all unlawful perks & extra compensations. Marami sa mga dating opisyal at directors na na-appoint sa iba't ibang ahensya ng gobyerno na tumanggap ng malalaking sahod at iba pang pribilehiyo noon ang malalakas kumontra at manira sa gobyerno ngayon. Una, para makabalik sa puwesto at tuloy ang benepisyo. Pangalawa, para maiwasang mabuko, makasuhan, o masingil tulad nito. And here's more: Marami rin sa mga dating opisyal ng GOCC & other gov't agencies ay mga anak, asawa, kapatid, kamag anakan ng ilang mga kilalang opinion makers, columnists, media men. Sila sila nakinabang sa DungMaTweed kaya ganun na lang ang pag-build up nila noon at pagtatanggol nila ngayon sa kanilang mga "amo". Let this development serve as a warning to all of them. 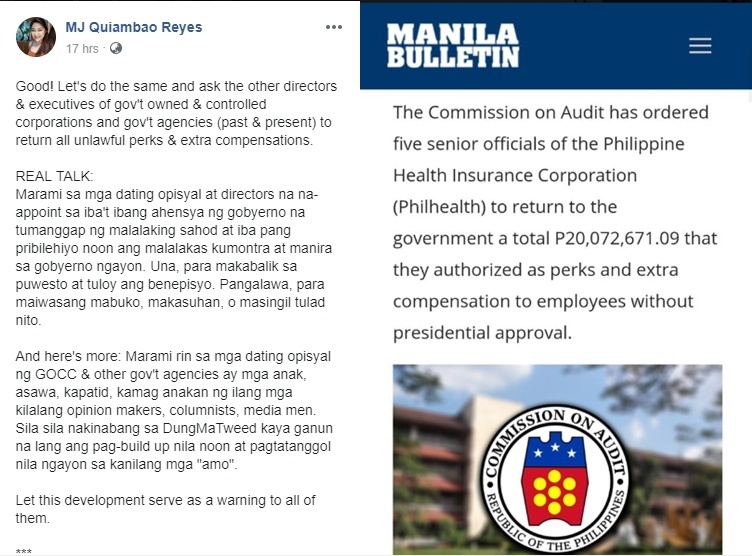 Due to the news report of Manila Bulletin revealing to the general public that the Commission on Audit ordered at least 5 PhilHealth Officials to return the P20-million paid as extra compensation to employees netizens reacted with joy to the said development. Nelson Dalope: Marami ng kinakabahan sa balitang ito... Nababahala na sila... For sure marami pang maglalabasang ganito balita... magandang development against graft and corruption... Umpisa pa lang ito..
Andy Strong: It's high time for them to do so. Tsk tsk tsk. Yung anak ni Antonino taga socksargen na bata ni mar. Isa din yun sa mga beneficiary. Thelma Flores: Mga makakapal ang mukha, mga mgnanakaw, mga mandurugas, mga satanas, mga demonyong nanaog sa lupa, sana. Makulong n kyong lahat n ngpahirap sa pilipinas kong mahal.